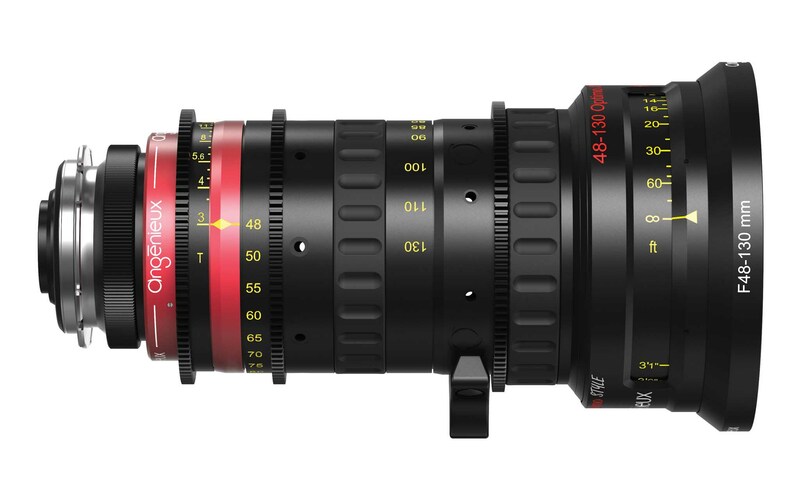 Angenieux welcomes a 3rd sister in their lightweight, high-class, high-quality, compact Optimo Style family of S35 mm format zooms. The new 48-130 T3.0 zoom lens joins the Optimo Style 16-40 T2.8 and 30-76 T2.8 zooms. Actually there’s a 4th Style sibling, a bit longer, less accustomed to hand-holding, but equally popular. He’s the bigger brother: Angenieux’s Optimo Style 25-250 T3.5. The new 48-130 T3.0 is the longest zoom in the lightweight series: excellent for close-ups, portraits, and tighter angles on all productions. The Angenieux Optimo Style 48-130 has superb optical performances, covers an image circle up to 34.6 mm diameter, with a constant maximum aperture of T3.0. There’s no ramping (change of exposure) when zooming in. As with the rest of the Optimo Style family, there’s minimal breathing (changing image size when focusing), minimal distortion and minimal optical aberration. The image quality is superb and matches the rest of the Angénieux line in look and character. The lens shares the familiar, precise, rugged construction of the Style series, with 320 degree rotation of the focus barrel, and industry-standard 0.8M gears on the focus, iris and zoom barrels. Optimo Style lightweight zooms are excellent for handheld, remote heads, on Steadicams, gimbals, rigs and drones. With just 3 lenses, the Optimo Style lightweight zooms let you cover a focal length range from 16 mm to 130 mm and on to 260 mm with Angénieux’s 2x extender. Just a quick review of Optimo Style compared with Optimo Spherical (Classic) and Optimo DP Angenieux zooms. Classic (15-40 T2.6, 28-76 T2.6, 45-120 T2.8 came first and continue to be the premium, top of the line models with the best optical performance. Optimo DP (sometimes called Rouge)16-42 T2.8 and 30-80 T2.8 had protruding rear elements, couldn’t be used with spinning mirror shutters, and were discontinued. The new Optimo Style series can be used on the latest digital cameras and cameras with mirror shutters and have a PL mount that is easily interchanged to Canon EF or Panavision PV mount. Compact and very lightweight (1.95kg / 4.3 lb). Great for handheld, Steadicam, gimbals, rigs, aerials and drones. Available in PL mount. Easily interchangeable to Canon EF or Panavision PV mount. Additional details and information on the new Type EZ zooms in the April edition of FDTimes to be distributed on April 24.